Mr. Hugo Camacho began his membership with the Jukido Jujitsu Academy in January 2008 under the tutelage of Sensei George Rego. Since that time, Mr. Camacho has been among the most active members of the dojo. In addition to consistent weekly training in jujitsu classes at the Jukido Academy, he regularly participates in all special training events, seminars with the most senior sensei & masters (on both the local and national level), and advanced black belt training sessions. Mr. Camacho was fortunate to experience the instruction of the art’s founder, the late Shihan Paul Arel, on two separate occasions in Seattle, WA and Palm Coast, Florida before the passing of the legendary master. Due to his unique combination of physical size, strength, and speed coupled with equally impressive technical skill – he has become a favorite training partner of his sensei. Mr. Camacho’s early training experience was difficult. Suffering from several herniated disks in his spine – the process of acclimating his body to the training and learning proper form (including in ukemi or break-falling) was a significant challenge. However, showing the fighting spirit and “never say die attitude” that would later make him a future black belt – he overcame the challenge, where many others would have given in, and successfully endeavored to become one of the best students in Jukido Academy history. He is a living testimonial as to what can be overcome with the proper mindset and full dedication to the pursuit of excellence through art of Jukido Jujitsu. Along with fellow black belt, Mr. Brian Wilson, he underwent the extensive black belt testing experience that has become a legendary hallmark at the Jukido Academy. A rite of passage that has is purposely designed to test the technique, body, and spirit of the individual who aspires to become one of the coveted and rare black belts of jujitsu under the Jukido Academy banner. The testing process took several months and consisted of six separate examinations covering various aspects of our comprehensive jujitsu self-defense system. Many of the examinations took well over an hour of full-intensity self-defense, kata, sparring (randori), disarming, and other aspects of Jukido Jujitsu. His final rank evaluation took place during the 2013 IKA National Seminar under a judging board made up of the art’s most senior instructors and masters . After an impressive display of proficiency and fighting spirit – he was unanimously awarded the coveted black belt (shodan). In 2017, he was awarded the rank of nidan (2nd degree black belt) by his sensei and IKA. Mr. Camacho is well known for his combination of physicality, technical ability, and unshakable loyalty. While expressing a spirit of kaizen (continuous improvement) in his own life both on and off the mats – he has become a vital part of the instructional team at Jukido Academy where he helps students of all ages master their knowledge of self-defense. His approach is analytical in both training and teaching. 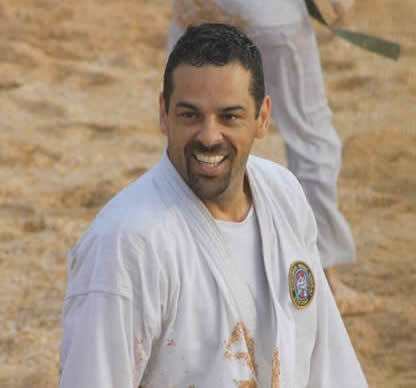 His favorite modalities of practice include randori (freestyle jujitsu sparring), ne-waza (groundwork) based self-defense, and throwing (nage-waza). His journey continues on the Jukido path towards advanced jujitsu black belt rank. Outside of his study of martial arts, Mr. Camacho is a highly respected local business owner. His award winning company, Ideal Homes of Palm Coast, Inc. (www.idealhomespalmcoast.com) is widely considered among the most professional and competent construction companies in Palm Coast and Flagler County, Florida with integrity that is beyond question. He is the proud husband and the father of two children, who are also members of the Jukido Academy, Alex and Jessica Camacho.